Alberto Dominguez, Landscape Architect in London says: "I have a Revit question about external paving. We have been developing a project in Revit, architecture and landscape, but there is a problem with the construction drawings for the external landscape finishes. 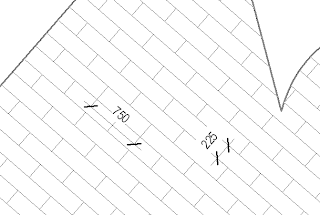 We are having to draw the paving units and joints as 2D detail lines as we have been unable to find a way to set up specific paving unit dimensions with Revit. This process (drawing 2D detail lines in Revit) is a slow and painful one, which also makes the project file bigger so I would really appreciate if any of you could let me know if there is a practical solution to this problem. " John Vogt in St.Louis quick solution:The easiest way to do this is to create a custom filled region using a hatch pattern text file with a .pat extension like this. Add a filled region in Revit, duplicate and name, go to type properties and edit Fill Pattern, select Model pattern type and change the settings, select custom, import pattern and name. Select OK.
rotated as needed. 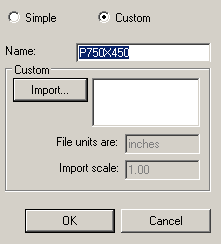 The easiest way to do this is to create a custom filled region using a hatch pattern text file with a .pat extension like this.